You are in Chico, it is summer, and the pavement of the main square is hot enough to sear a steak. Kids splash through water jets and you wonder where an adult can chill out. Fortunately, Chico has you covered. 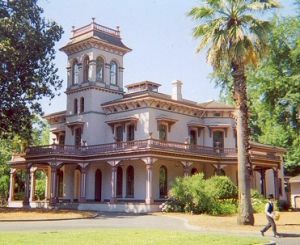 You take a short walk past elegant Victorians under a canopy of 100-year old shade trees to Bidwell Park. The park has the coolest spot in town, a swimming pool fed by snow melt from the nearby Sierra Nevada foothills. Bidwell Park is one of the largest city parks in the nation. Much of the park remains in its natural state. The park limits stretch 11 miles into the foothills where terrain of steep canyons and volcanic outcrops appeal to mountain bikers and rock climbers. You head to Sycamore Pool, a popular swimming area formed by damming Big Chico Creek. After a dip in the pool you dog shake, drip drying in your shorts and T-shirt, and consider your next move. All this cold water has made you mighty thirsty. Chico has another type of watering hole to offer, the highly award Sierra Nevada Brewing Company. In 1979, two Chicoans developed a craft ale “as good as any in the world.” In a humble warehouse with second hand equipment they produced Sierra Nevada Pale Ale. It became the benchmark for American premium ales. Years later the recipe hasn’t changed but the Brewery has. On the outskirts of Chico you find their efficient modern complex. 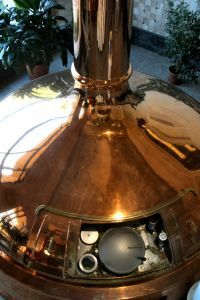 The brewery is a model of self-sufficiency. It farms its own supply of rare hops. After being used for brewing these nutricious hops become feed for beef cattle that furnish steaks for local restaurants. With one of the country’s largest solar panel installations on its roof tops the brewery supplies nearly 100% of its power. Employees remain so long with the company that their faces appear in a mural you pass during the tour. The tour is over and it is time to sample the wares. The Tap Room offers nearly everything Sierra Nevada makes including some small production ales and lagers not available anywhere else. With a sampler of 16 different brews you take your time, enjoying the nuances of each wonderfully different creation. Refreshed, it is time to think about dinner. There are numerous inexpensive food options, this being a university town (California State University Chico was founded in 1887 and is the second oldest in the CSU chain. It now boasts 16,000 full time students). But you are in the mood for a great steak in comfortable surroundings. Several locals have suggested the stylish 5th Street Steak House. The wood, brick and glass bar and dining rooms simmer with the conversations of local professionals. You choose from the moderately priced wine list and settle in to enjoy fresh-market side dishes and a top quality steak, cooked as requested. Now for an after dinner stroll on this beautifully warm summer evening. You head back to the main square and the Thursday Night Farmers Market. Shaved ice stands, homemade tamales, and produce grown just a few miles up the valley draw crowds. 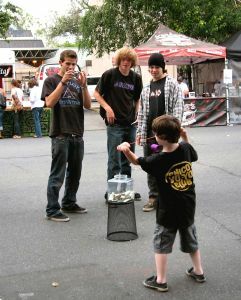 So do members of the Chico Yoyo Club as they demonstrate the remarkable gymnastics a yoyo can perform in the hands of devotees. Chico is the home of the National Yoyo Museum , housing not only the worlds’ largest working yoyo but thousands of original examples of this seemingly low-tech toy. A yoyo-er in the museum introduces you to design differences, prize winning and rare yoyos, and explains what it takes to win the World Yoyo Competition. It has been a full day and the newly refurbished Hotel Diamond offers a serenely appointed room just steps away. Sipping an after diner port, you listen to a trio playing quietly in the hotel’s pleasant lounge. Next to you at the bar two long time friends joke about an acquaintance. Behind them a young man shakes the hand of the realtor who sold him his first house. You overhear someone excuse himself, step outdoors and answer a cell phone. He wears expensive leather loafers, slacks and an aloha shirt… just the right blend of quality and ease that you find in Chico.